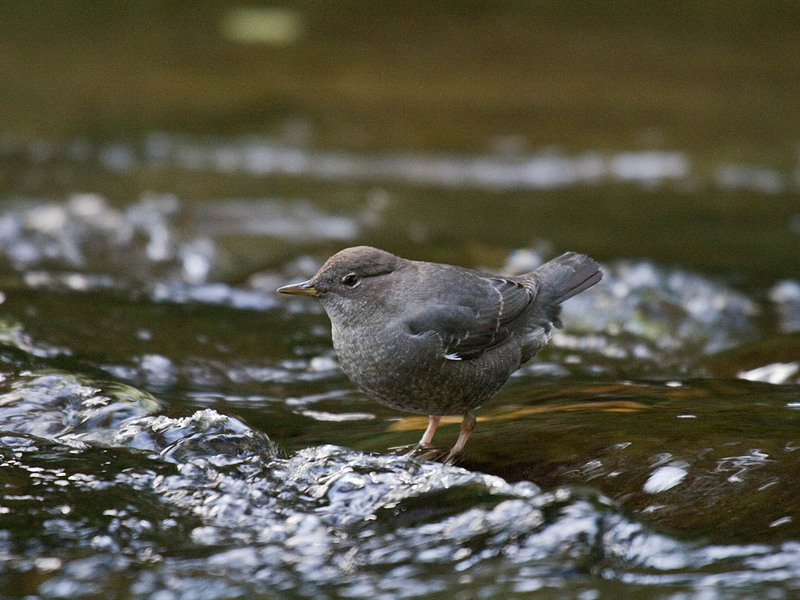 The habitat of the American Dipper (Cinclus americana) is usually clear, rushing, boulder-strewn, mountain streams, within tall conifer forests. For me, part of the joy of observing American Dippers is the associated mountain scenery, including grand forests, rushing streams, and roaring waterfalls. 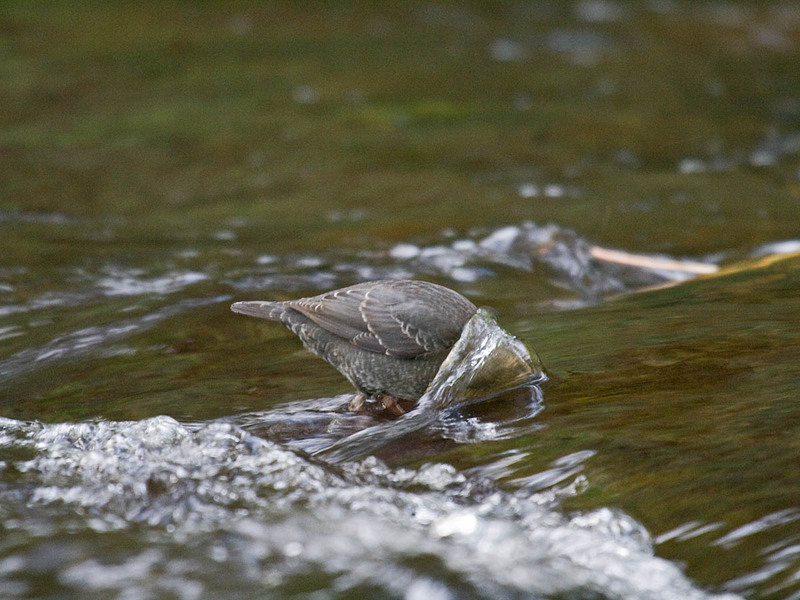 Dippers feed mostly under water on aquatic insects, primarily caddis fly larvae, by wading, diving, and using their wings to "fly" under water. They float buoyantly and swim on the surface (poorly) by paddling with unwebbed toes. They frequently walk about on the gravelly bottom of streams, sometimes more than 6 feet under the surface of the water. 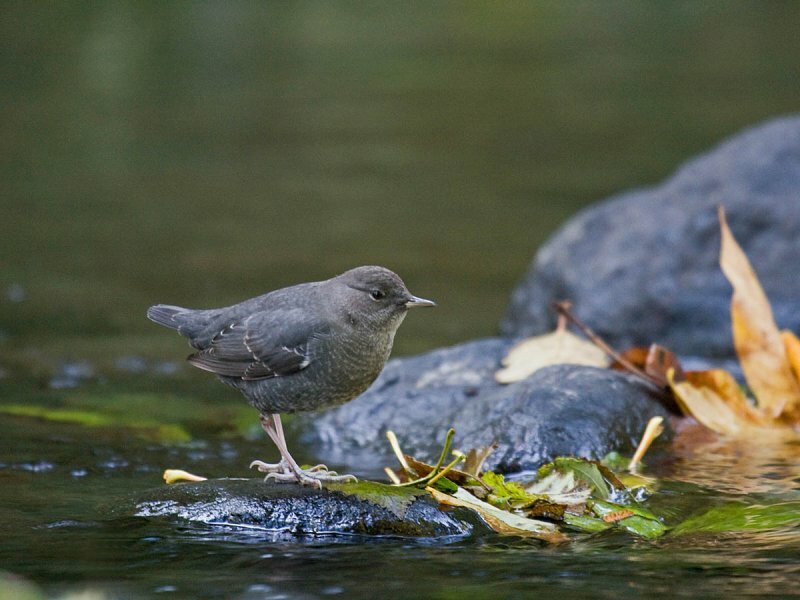 They are usually first noticed bobbing ("dipping") on a rock midstream, thus their name, "dipper." A colloquial name for the dipper is water ouzel. Ouzel is another name for the Common Blackbird (Turdus marula), a blackish European thrush similar to the American Robin (Turdus migratorius). Thus, "water ouzel" is bird that looks like the Common Blackbird but is found in the water, rather than in the garden. The White-throated Dipper (Cinclus cinclus), found in Europe, looks superficially like the Ring Ouzel (Turdus torquatus), a thrush closely related to the Common Blackbird. There are 5 species of dippers in the world, one each in North America, Europe, and Asia, and two species in South America. All photos November 1, 2011 by Greg Gillson at the mouth of Scoggins Creek into Hagg Lake, Washington County, Oregon. Editor's Note: I recall a post Greg did a couple years back about How to find a Dipper Nest, so I link to it here for your further reading enjoyment. Thanks for such an informative post Kevin, now I know why the Dipper is called a "water ouzel"! The American Dipper is such a unique bird. Thanks for the great information. In mid-October this year I was camping in Utah's Mill Creek Canyon. We had a few Dipper's hanging out right next to our camp. I was surprised at how loud they called and how they chased each other. In the past, I had only seen them solitary and casually feeding in the river. Nice post Greg! A very interesting bird indeed. Interesting post, fascinating bird, great photos! I always learn something from your interesting posts. Thanks! I did an article on the dipper a couple of years ago and boy are they fun to watch. There is a secret report of a snowy near Rexburg, but I have not found it. I will let you know if I find it. I so enjoyed reading this wonderful post filled with interesting information and fantastic images. It's always a joy to learn something new. I have never seen an American Dipper before so I'm especially happy to view them on this post. Very cool bird! Interesting article and nice photos Greg. It's not often that images of birds where neither eye can be seen appeal to me much but I particularly like that last shot where the water is running over the birds head and neck. Thank you all for your kind words. Part of the joy of birding for me is learning something new. I was quite happy also with these photos, As typical for dippers, it seems, it was an overcast day with indirect light in the river ravine. Photographing these active birds really pushes my equipment and photography understanding to the limit. Mais perto da nascente do rio Mondego, habita um melro de agua, peito claro, é uma ave rara, acho que existem poucos, gosta da agua limpa, alimenta-se no fundo das margens e quedas de agua. Excelentes fotos bem como seus textos. Great post Mr. Gillson, and excellent photos too. They really capture the Dipper ethos. I remember my first Dipper. I had no idea such a bird existed, and was totally blown away to see this weird slate blue robin thing walking around on the bottom of a stream up near Crater Lake in Oregon. Fantastic bird. One of a kind. How I miss seeing these delightful little birds! Great photos. Love the last one with its head under water! One of my favorite birds. Always a treat to watch these guys/gals dipping along the creeks and rivers.